Bringing sellers and buyers together in a marketplace is basic to business. The Chinese market is no longer the village square, but a nation of 1.3 billion people that is generating hundreds of thousands of new businesses every year. And the 12-year-old commercial exchange Alibaba.com, with 46 million business-to-business users in China and 19 million more worldwide, is the new village square. 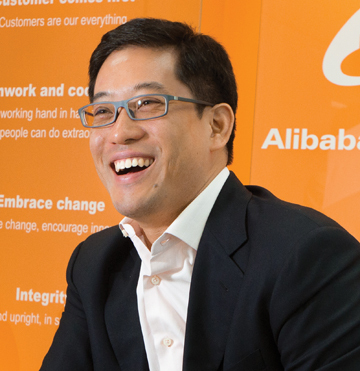 Brian Wong ’96, the first American hired by Alibaba, is working to enlarge it. As vice president of global sales at the parent site, Hong Kong-based Wong is responsible for business development and customer service operations in markets such as India, Turkey, Brazil, Malaysia, Korea, and Vietnam—plus the United States. Founder of Home Decorators Collection. He writes from Dongguan, China. When I graduated from Swarthmore, save for a cross-country team trip to Illinois, I had not been west of Carlisle, Pa. I had never heard of Dongguan—now one of the 80-plus cities in China with more than a million residents. I didn’t know that I would travel to Dongguan and other Asian cities more than 60 times for business. Yet although I didn’t leave Swarthmore a world traveler, I was prepared to seize the opportunities that a changing world presented. 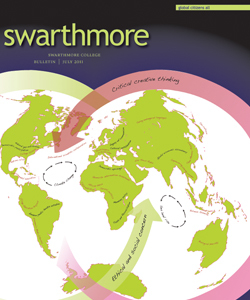 Here are six ways that Swarthmore prepared me to do business around the world. 1. Analyzing opportunities. Fifteen years ago, few retailers of home furnishings and accessories were directly sourcing in Asia. But when you studied the economics objectively, it seemed eminently worth the effort to bypass middlemen and source directly from factories. 2. Sticking to your guns. Defending an unpopular point of view in a seminar was not dissimilar to the process of persuading colleagues and a reluctant partner to venture into the unknown. 3. Believing in a fundamental value. Although making a profit is fundamental, the desire to make a difference in the world is a powerful motivator. I took great satisfaction in being part of an enterprise that created thousands of jobs in China, Brazil, India, Malaysia, and Indonesia. Sharing in that satisfaction motivated colleagues to do more than they might have for the simple goal of a profit. 4. Deferring gratification. Running track and cross-country taught me much about the power of deferred gratification. Working at training—or building a business—often takes longer than you plan, but it almost always pays off. 5. Power of a group. A Swarthmore seminar is a testament to the potential for a group to accomplish more than you can on your own. I have traveled ceaselessly to experience the benefits of gathering designers, marketers, production managers, and factory owners together to develop ways to increase our collective business. 6. Love of reading. I have spent more time in airplanes than any sane person should. (Later this year, I’ll reach nine million miles on American Airlines.) If it weren’t for the countless books I’ve lugged with me in a pre-Kindle world, I think I would have gone stir-crazy, or at least despaired over the time wasted.